Don’t call us. No, really: just don’t call us. Stars: DNF Two and a half of five. Review format: DNF rant plus links. Provenance: Borrowed from the library. 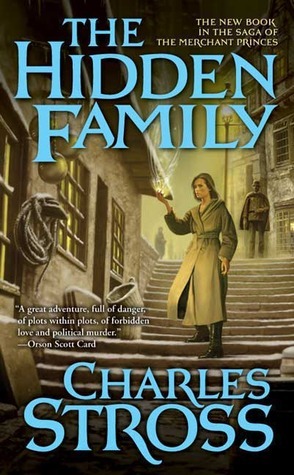 I gave The Family Trade a three-star rating, and started into the sequel with guarded expectations. Um, I like the cover a good deal. Sadly for me, the negative expectations were quickly fulfilled. The flaws of the predecessor were loomingly prominent in this sequel. I was hoping that the sequel would surpass the original, but it has been very much the same. There wasn’t one big nail in the coffin – more like a thousand paper cuts. None, and I mean none, of the interesting unresolved topics are being taken up yet. The plotting is mechanical and heavy-handed. Oooh, could the foster mother be any more ambiguous and possibly concealing something? Oh, look, she admits she’s concealing something. Secondary characters who were ambiguously threatening in book one… peel off that stretchy mask with the flair of a Scooby Doo villain and gloat over their revealed black-hat status. An entire new venue (third alternate Earth) pops up in the shooting gallery for double your extended-series enjoyment. Pah. Removing the bookmark at page 117 of 309. I’m heading to the library to pick up Dragon Haven. Next up on my review list: Tanya huff’s The Truth of Valor. Too naive to survive – will the series be worth it? Stars: Three out of five. Review format: Review plus links. The Family Trade – Charles Stross. Book 1 of The Merchant Princes. Summary: Miriam Beckstein is happy in her life. She’s a successful reporter for a hi-tech magazine in Boston, making good money doing what she loves. When her researcher brings her iron-clad evidence of a money-laundering scheme, Miriam thinks she’s found the story of the year. But when she takes it to her editor, she’s fired on the spot and gets a death threat from the criminals she has uncovered. Before the day is over, she’s received a locket left by the mother she never knew-the mother who was murdered when she was an infant. Within is a knotwork pattern, which has a hypnotic effect on her. Before she knows it, she’s transported herself to a parallel Earth, a world where knights on horseback chase their prey with automatic weapons, and where world-skipping assassins lurk just on the other side of reality – a world where her true family runs things. The six families of the Clan rule the kingdom of Gruinmarkt from behind the scenes, a mixture of nobility and criminal conspirators whose power to walk between the worlds makes them rich in both. Braids of family loyalty and intermarriage provide a fragile guarantee of peace, but a recently-ended civil war has left the families shaken and suspicious. Taken in by her mother’s people, she becomes the star of the story of the century- as Cinderella without a fairy godmother. As her mother’s heir, Miriam is hailed as the prodigal countess Helge Thorold-Hjorth, and feted and feasted. Provenance: Borrowed from the local library. The Family Trade’s Miriam Beckstein at first struck me as a heroine too naive to survive. Having uncovered her boss’ complicity in a multi-million-dollar money-laundring deal, Miriam is bogglingly placid. Even the death-threat voicemail left on her answering machine doesn’t rattle her much – she ponders what freelance for her next article, and frets a little over the gap this unjust firing will leave on her resume. No excuses: she’s not a dairymaid from a fantasy kingdom, or an eight-year-old girl: she’s supposed to be a gutsy investigative reporter. I was starting to develop sneer-lines from an incredulous frown, when luckily Miriam decided to unleash the magical locket, travel to the parallel world, and discover her true birthright. The book summary makes this book sound a star-or-so better than I think it is. From this point onwards in the book, Stross’ little universe clicks along happily and enjoyably. Miriam starts to work out her place in the new world, and begins scheming how to reform it. Speaking of scheming, the plot momentum is on the weak side. Miriam travels hither and yon, makes some alliances and possible enemies, and … gets to the end of the book. There’s no goal attained or enemy identified. planet – the festival – the critics. Feels like it is re-treading lots of material from a series. Not so much fun. Interesting – some I have liked a lot, others really not so much.